The Chalet houses 40 to 95 guests in dormitory style rooms on the upper two floors of this unique four-floor A-frame. Several sleeping rooms are available on the bottom floor as well if extra rooms are needed. Restrooms and showers are centrally located on top two floors as well as the bottom floor for easy guest access. The dining and meeting area is centered on the middle floor of the Chalet, an area that offers plenty of space for groups to gather together with comfortable couches and chairs to give your meetings that special touch. Audio/Video equipment is available at The Chalet including, TV and basic PA sound system. The Mt. Baker Chalet is a full service facility, and our chef is ready to provide your group with warm hearty meals or prepare a sack lunch for a day of hiking or on the ski slope. The deck off this central floor also gives your group the opportunity to relax and enjoy the surroundings no matter the season, with magnificent, one of a kind views any way you look. Below are the options provided for booking. If you have any questions, please don't hesitate to contact our guest services team who are ready to help answer any questions you may have. Stay and play where no one else can! The Chalet at Mt. Baker is a one of kind facility located right next to the Mt. Baker Ski area. The Chalet is the only facility available for overnight accommodations at Mt. Baker and we would love to partner with you for your next retreat or event. Book The Chalet and plan your stay how you want! Our hosting team will be there to serve you throughout your stay, while our food service department takes care of all the meals. Our hope is to provide the space for you to allow your group to experience a week or weekend away like no other. For detailed information on how you can book your next retreat at The Chalet, click the button below. Each winter, Camp Firwood, in partnership with The Chalet at Mt. Baker invites youth groups of all sizes to join together for an incredible weekend of games, worship and fellowship with one another. Camp Firwood staff bring all the fun of the summer program up to the mountain where we have a blast playing outrageous games with one another while getting an opportunity to meet new friends from other churches from all over the PNW. Each night we gather to worship together and have an opportunity to hear from a local speaker who will spend the weekend opening God's word and challenging your students in the faith. These weekends are perfect whether you have a large group and are looking for someone to partner with you to run a winter retreat, or if you have a smaller group of students and still want that winter retreat experience. Click on the link below for more detailed information and dates. Enjoy many of the surrounding hiking trails during your stay at The Chalet. 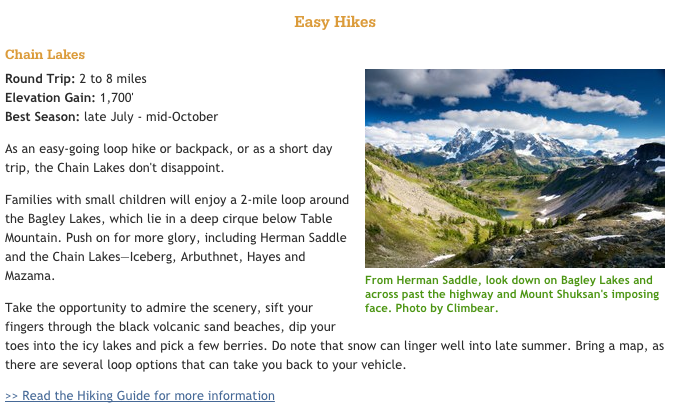 Look below for information regarding some of the more popular hiking trails, as well as some ideas for other things to do while you're enjoying your stay at The Chalet at Mt. Baker. For more detailed information for this trail please click here. "Artist Point is the top competitor for best viewpoint in the state. The beautifully shaped Mount Shuksan is the star of the area, with a gorgeous summit pyramid and several impressive glaciers. Mount Baker dominates the skyline in the southwest. Artist Point also is a great viewpoint for the Cascades, with sweeping views of the valley of Baker Lake and in the far distance peaks like Whitehorse Mountain, Three Fingers, Sloan Peak and White Chuck Mountain. Immediately from the trailhead beautiful peaks in the north are visible, such as American Border Peak, Mount Larrabee, and Goat Mountain." For more detailed information regarding a trip Artist Point, click here to be directed to the Washington Trail Association website.